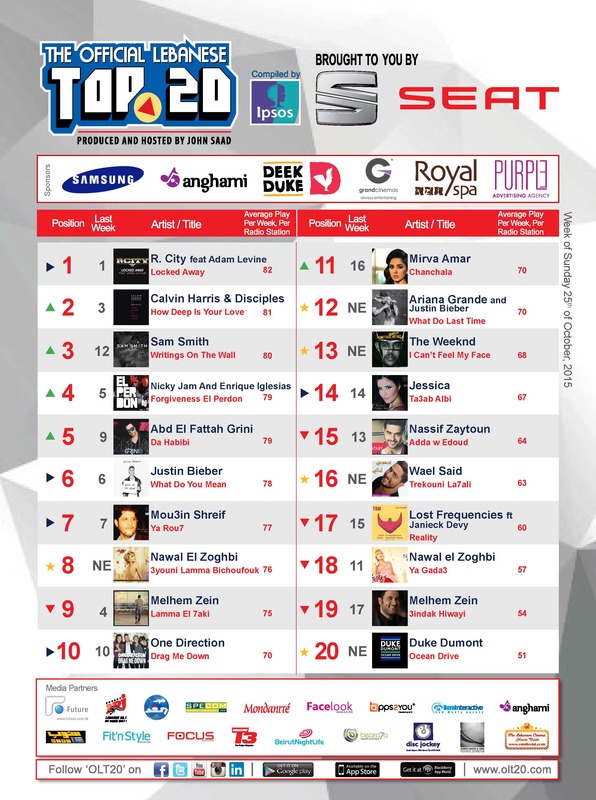 A big thumbs up to Virgin Island’s production duo Rock City featuring Adam Levine (lead singer of band Maroon 5) for extending their stay at pole position on The Official Lebanese Top 20 with “Locked Away”. Don’t forget to watch the Video on the OLT20 TV Show each week on Future TV (Part of Hits’N Bits). On this week’s chart we have 5 New Entries. The 1st of those is “Ocean Drive” from English DJ and deep house producer Duke Dumont which comes in at Number 20, followed by “Trekouni La 7ali” at Number 16 from Lebanese singer Wael Said, “What Do Last Time” at Number 12 from YouTuber Jake Marra who took the tropical house beats from Justin Bieber’s new single “What Do you Mean” and mixed them into Ariana Grande’s apologetic hit “One Last Time” to come up with a great pop song, and finally by “3youni Lamma Bichoufouk” at Number 8 from our friend Nawal El Zoghbi. Finally note that the song “Heik” from Naji Osta completely disappeared from this week’s Chart as it was removed from the Playlists of most Radio Stations in Lebanon. Note that you can check out the latest videos from your favorite singers on the TV show “Hits N Bits / OLT20” on Future TV every Friday evening around 9:30pm, and Sunday evening at around 7pm for the re-run.